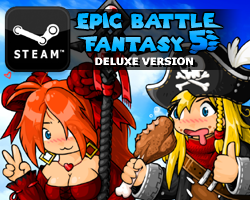 Hey guys, version 1.5 of EBF5 is available on Steam. 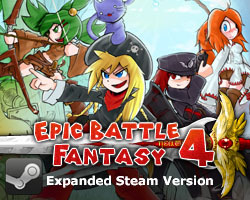 To opt-in, go to Steam Client > EBF5 > right-click > Properties > Betas > Select the other version. I’ll set this live for everyone in a few days if no problems are found. • Nerfed the Cosmic Gigalith. It no longer does damage when killed, and it has less HP if you save after beating it. • Buffed the Evil Players, by making cheap tactics less effective against them. • Added a new music track, used in the 1st and 4th dungeons. • Reduced foe stat growth after level 36, so players are not punished for grinding at the end of the game. • Fixed a bunch of minor bugs, translation errors, and made some minor balancing changes, like buffing Snow Cats. • Someone pointed out that the audio was set to mono rather than stereo, so let me know if it sounds any better now. This might be the last update for a few months. But I’ve got a lot of new content planned for later! This entry was posted in Epic Battle Fantasy 5 on January 16, 2019 by Matt Roszak. Matt, what have you meant by nerfing gigalith? Did you remove his last ultimate attack? If so, I suggest to return it, but restrict to epic difficulty. Yeah. I had to try and not hit too hard in order to have sufficient turns to prepare for the doomsday. Pretty much the only thing that made gigalith a concern. I wish it’ll receive some sort of buff to compensate for this somehow. Like instead it charges and launches a suicidal attack at low health. Guys, it says the nerfs. Hmm. Read what I write again. And think about it. Is it possible to write something like that without knowing what changed? The boss don’t scale with you so anything above level 36 doesn’t count for balancing consideration. Can you please set the EBF5 progress chart to 150%? Wait, we weren’t supposed to use cheap tactics against evil players? I thought that was the entire reason why they were able to be afflicted with tired: so you could beat them more easily. The strat for fighting god is to make him defend and take out 3/4 of his hp with giga drill. 3/4? Are you on epic? With 95% buff, heavy, stagger, enchant, weapon and armor both boosting earth. Enemy with 100 on both defense and defend status I could only deal like 1/4 (about 2 million damage at level 35). I did 4.5 mill at lv 35 soo. I’m not sure how to feel about Soul Eater invalidating most other swords due to the fact that it does not even need STAB to compete in damage with other swords. And the fact that armor STABs exist amplifies this even further. Sure it does make him frail but NoLegs still dies more often. What do you mean by STAB cause i feel like I’m really oblivious to something. Same Type Attack Bonus. A term originated from Pokemon. In this case it refers to the “boost the damage of x attack” effects on weapons/armors. Some people on discord used this word for that and I thought it made sense. So I started using it as well. Can you do a holiday quest for Fourth of July? I know you’re not an American, but I notice there aren’t any quests specific to Summer. I’m also okay with quests revolving around St. Patrick’s Day and Thanksgiving if you’re okay with it. 4th of July is nationality specific, while St. Patricks day and Chinese New Year and the somewhat less celebrated ones are celebrated by a wide amount of people from many different places. I gave Matt the big bullet skill, buffed him up and kept giving Matteus dry status(basically 300k damage every hit). I used Lance with Heavy Claw and other damage boosting equips you mentioned aside from the armor which was Camo Jacket instead. Works wonders and deals 900k damage per hit at peak. God is actually kind of a joke because as i said a few comments above you can rip him to sherds with giga drill. You must be a fan of being punished for grinding past level 36. Man, my first run and the demonic guys were hard as hell, they didn’t need a buff fer sure. About to beat God cat, not sure how to go about it. Amazing game so far. Didn’t think I would enjoy the capturing part of the game but you blew me away man. It feels so good to get em, when that box stops shaking. And i’m glad i bought the game, seeing as how yer still expanding on it. Spoiler Alert: If you change yer computer game clock you can get equips that are normally out of reach. Not sure yuh care but I do like how you added that factor in. End Spoiler. One thing to note is how many people are annoyed that upgrading equips forces you to capture monsters again. The ones used aren’t good in battle so i kinda understand it but for min/max kinda people it’s annoying. There are a lot of monsters that you can jsut wet and lighting or ice them too. Like a lot. And yuh did it again with the equips, yuh get them way after yuh need em. I understand there has to be good pickups as yuh go along so that’s fine. But there were a couple times where i was jsut like, really.. couldn’t give that ta me a battle ago? :D I managed tho, an it’s such a good game, i can’t believe you charge so little for it honestly. This game is worth AAA status money man. And if you upped the price i would buy it again jsut ta help yuh out. Yer awesome. And thank you. Buffed dark characters Bruh i can barely beat em normally. I also think you should not remove the last attack from the Gigalith.The final boss is pretty well balanced imo. I can’t speak for anyone else, but I only received one new equip for completing the quest, so I’m wondering if that’s a bug or just a typo. You indeed received one equip. The other is a skill. I haven’t checked, but I’m pretty sure you get one equip from the quest, and another from the shop, as with the Halloween and Christmas quest. is anyone getting this bug where you don’t get the achievement for super saiyan and deathbringer on newgames+? Hey! Can i play the beta EBF5 now ? I’d like to suggest a new type of weapon for Anna and Natz: empty bow and empty staff. The idea is to put one of the captured creatures into the weapon, so it would do the same damage or effect to foes. As an option, said creature may last only one fight and must be replaced after the battle – it will force player to capture foes again and again. Where are the new quest NPCs?